Ganna Walska, born Hanna Puacz, in 1887, came from Brest-Litovsk, Poland. Her interesting life included opera singing, and marriage to six husbands, several of them very wealthy. 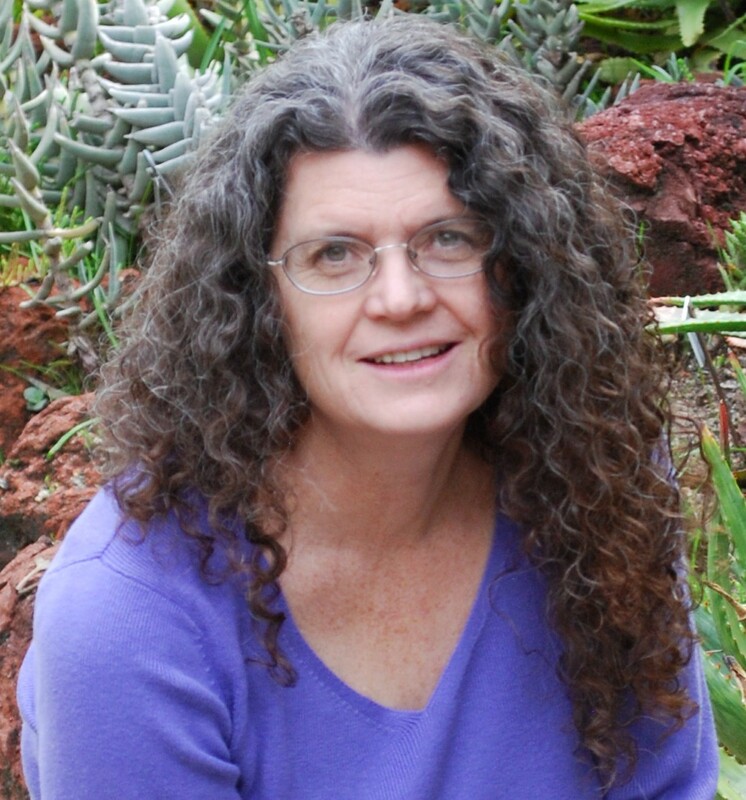 Her legacy includes a renowned botanical garden in Southern California. When Hanna began to study music, she adopted the stage name of Madame Ganna Walska. 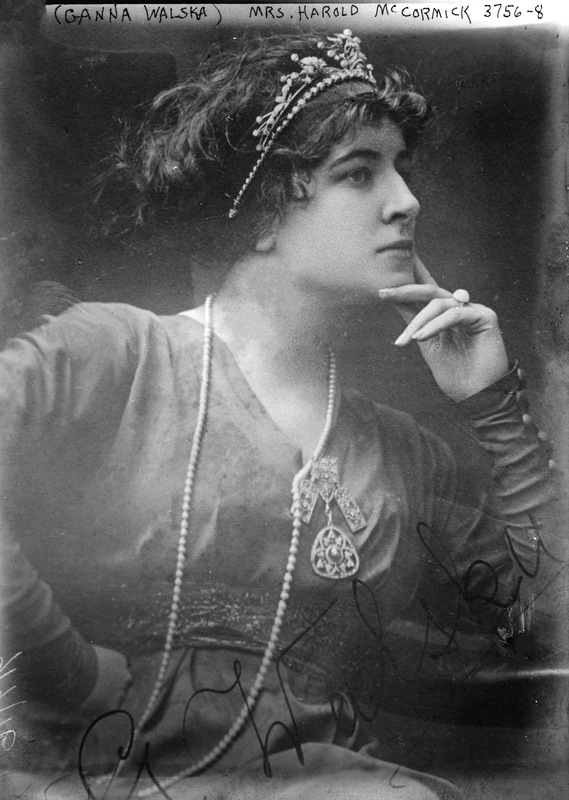 Ganna, the Russian form of Hanna, Walska, similar to her favorite music, the waltz, and Madame being the title used for actresses and opera singers in Europe. Ganna had aspirations to rise to the top and be known for her singing. nerves rendered her incapable of performing to the degree needed. She tried many remedies to combat the nerves, but according to her memoirs, Always Room at the Top, nothing worked. She sang at many venues in New York and Paris, but she wrote that during a performance of Giordano’s, Fedora, in Havana, she veered off key so much that the audience pelted her with rotten vegetables. funds, not those of her wealthy husband, and told a reporter, "I will never appear in my own theatre until I have gained recognition based solely on my merits as an artist." McCormick loved her voice and promoted her career in lavish ways. Many people claimed McCormick to be the only person who truly loved Ganna’s singing. Despite the thousands of dollars, McCormick spent on her voice lessons, Ganna still struggled with maintaining a presence on the stage. In 1925, a New York Times headline reported, "Ganna Walska Fails as Butterfly: Voice Deserts Her Again When She Essays Role of Puccini's Heroine" (January 29, 1925) Ganna’s opera career inspired Orsen Welles to include her in his movie, Citizen Kane. The character of Susan Alexander was reportedly based on Ganna Walska. In 1941, after marrying for the sixth time, and at the encouragement of her husband, Ganna pursued a love of the botanical and purchased a 37-acre estate in Montecito, California near Santa Barbara. 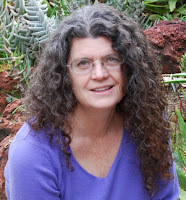 She poured her resources into creating a garden of rare plants. Her artistic talents helped to create a botanical wonderland of exquisite beauty. Her creative talents led Madame Walska to group plant types together, also trying to purchase the most unusual of each type of plant. Lotusland today still reflects this original purpose with a variety of gardens scattered throughout the whole. Ganna loved cacti and succulents. Along her drive, there were multiple varieties with cacti, new world plants, on one side, and succulents, old world plants, on the other. 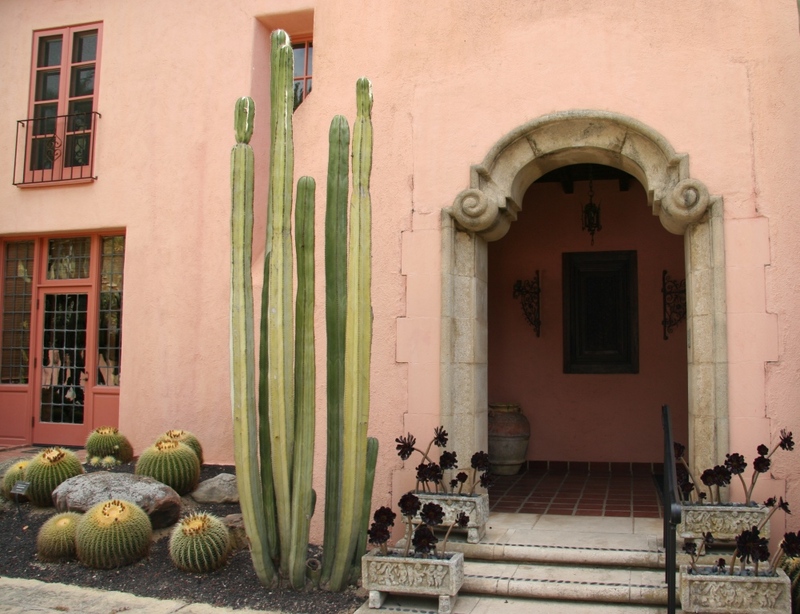 One of her first changes to her estate was to add cactus, succulents and euphorbias to the beds in front of her home. 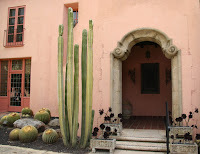 There are also separate cactus and succulent gardens on the estate. In 1948, Madame Walska constructed a theater garden. 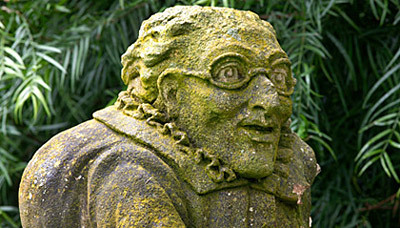 Here she placed her “grotesques,” small statues she brought over from France. In this part of the garden there are three tiers of seating that will hold up to 100 people. The seating is made of sandstone. 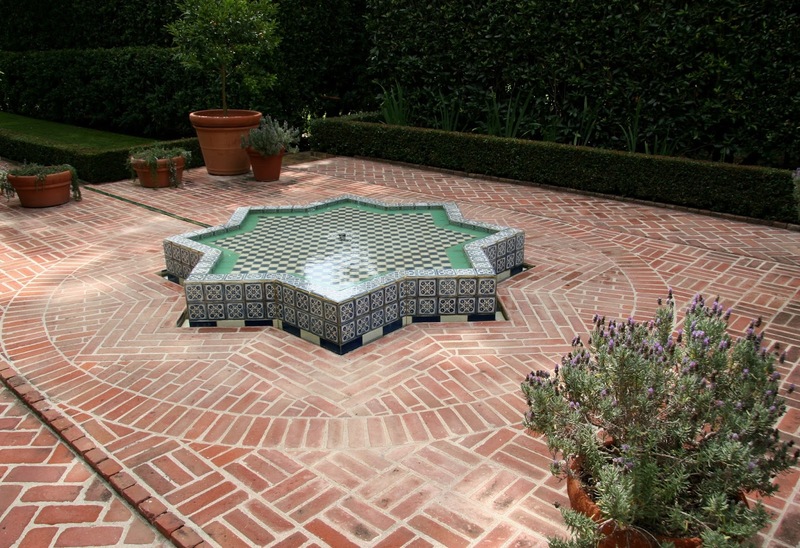 being a Moorish fountain first put in by the estate’s original owners. There are pebble mosaics, commissioned by Madame Walska. The Parterre leads into the Topiary garden which has a central clock that is 25 feet in diameter. Each section of the clock contains succulents and a copper zodiac symbol. The clock was added in 1955. The last garden Ganna Walska created was the Cycad garden. It is said she auctioned off some of her extensive jewelry collection to fund the purchase of the cycads. 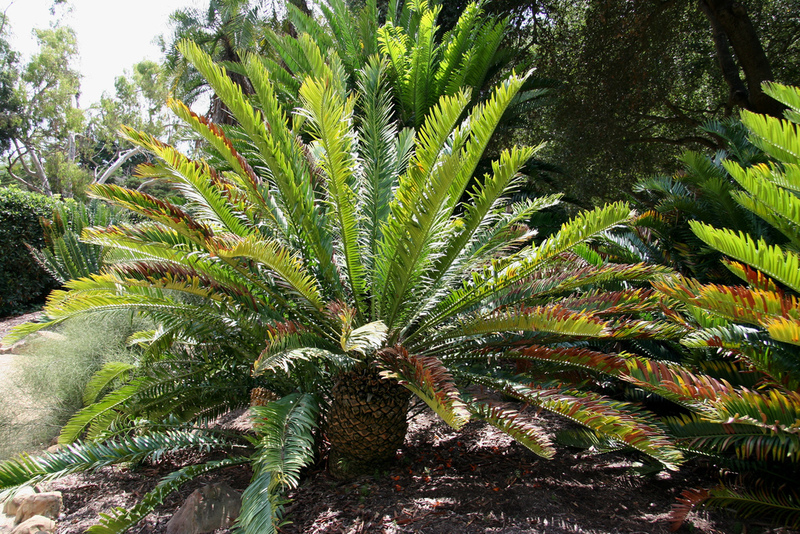 Lotusland is thought to have the most complete collection of cycads found in an American public garden. There are over 900 specimens, many endangered or extinct in the wild. Madame Ganna Walska accomplished much in her lifetime. Have you ever read about her? 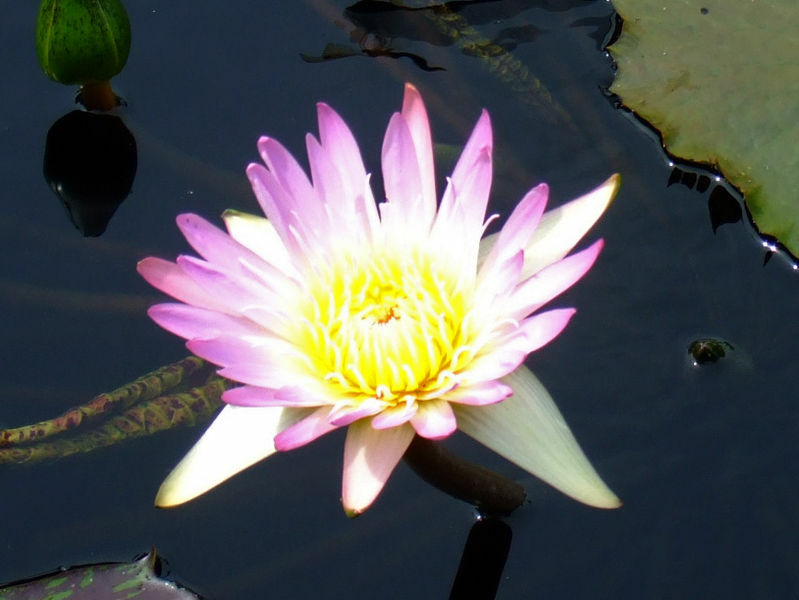 Have you ever visited Lotusland? I haven’t been there, but after researching this blog, I know I will go as soon as I have the opportunity. I do hope you get to visit, Sharon. I was so fascinated by the history behind Lotusland, that I'm excited to go there. Very interesting, Nancy, especially since my husband and I used to own a commercial greenhouse. No, I've heard of Madame Ganna Walska or Lotusland, and I have a deep respect for anyone who values botany over jewelry. Kudos to her. Lotusland is going on my bucket lists as one of the great botanical gardens I'd like to see someday. Thank you, Anita. 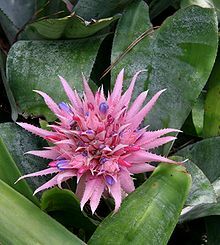 I have a long list of botanical gardens I would love to see. Thanks for commenting. Good morning, Nancy. Fascinating post. Thank you. No, reading about Madame Ganna Walska & Lotusland here is a first for me. I love cactus, succulents and euphorbias, especially what we call Christmas Cactus and Thanksgiving Cactus. I recently learned the different between them - the Thanksgiving Cactus has a jagged edge, but the Christmas Cactus is rounded without points along the edge. Adding to my collection of leaf color as often as possible. Linda, thank you for your comments. I love cacti and succulents too. It's always fun to learn more about the things that interest us.